For the Great Los Angeles Walk 2012, we're going to trek through the street that gave L.A. its punk and new wave cred in the 1980s and early 90s. Not only is there the famed Melrose District shops and restaurants, but Melrose is home to Paramount Studios (celebrating its 100th anniversary this year); in East Hollywood is the hub of L.A.'s bike culture; and an epicenter of design and fashion (thanks in part to the mammoth Pacific Design Center). Participants will meet downtown on the steps of the Walt Disney Concert Hall at 9 a.m. on Saturday, Nov. 17, and proceed to walk the approximately 17-mile journey to the Pacific Ocean. We'll pass through a diverse cross-section of the region, including Downtown Los Angeles, Echo Park, East Hollywood, West Hollywood, Beverly Hills, Westwood and Santa Monica. As you know by now, I launched the Great Los Angeles Walk in 2006 as a way to celebrate my tenth year in Los Angeles. That year, inspired by the book "Wilshire Boulevard: Grand Concourse of Los Angeles," we walked Wilshire. In 2007, for an encore, we hiked down Pico Boulevard. The 2008 Walk took on Santa Monica Blvd. (via Sunset). 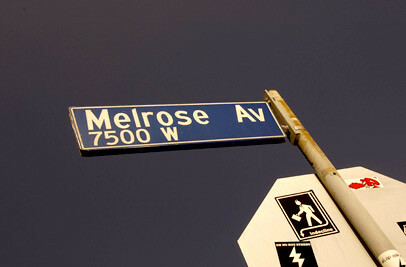 In 2009, the event kicked off in the historic West Adams district and walked to Venice Beach via Adams and Washington. For its fifth edition in 2010, the Great Los Angeles Walk returned to Wilshire. And last year, in 2011 we hit Hollywood. The Great Los Angeles Walk is a fantastic way to see your city up close and personal. Plus, it's a fun way to burn a few calories before gorging on Thanksgiving the following week. Keep checking out GreatLAWalk.com for details, and make sure you're on our email list by dropping a line to greatlawalk@mail.com. Also, you can RSVP on our Facebook event page. More info, including T-shirts, to come. ALSO, if you're interested in sponsoring a rest stop for walkers, or if you're a restaurant in willing to house our lunch or afterparty (don't worry, everyone's paying on their own dime), let us know! TWO MONTHS AWAY FROM THIS YEAR'S GREAT LOS ANGELES WALK! Keep Saturday, November 17, 2012 open! More details to come soon.